Kale is a vegetable that I have been wanting to try using for a while. I have seen a few kale dishes around and some of them combined kale with white beans. I thought that the kale would go nicely in an Italian style white bean soup. I knew that I wanted to include Italian style turkey sausage for some meat and flavour but for the rest of the ingredients I played it by ear. I wanted a bit of a rustic feel to the soup so I cut everything roughly leaving fairly large pieces. The white bean and kale soup with turkey sausage turned out well and it was really tasty. I think that I should have cut the kale into slightly smaller pieces but this way I got to experience more of the kale. The kale worked well in the soup. Even though it wilted it did not fall apart or turn mushy. I look forward to experimenting with kale again. I served the white bean and kale soup with some toasted cheesy garlic bread . Brown the sausage in a large pan and set aside. Heat the oil in the same pan. Add the onions and saute until tender, about 7-10 minutes. Add the garlic and saute until fragrant, about 30 seconds. Add the sausage, celery, carrots, tomatoes, white beans, kale, oregano, bay leaf, red pepper flakes, parmigiano reggiano rind. Add enough chicken stock to cover. Bring to a boil, reduce the heat and simmer for 30-60 minutes. Remove the bay leaf and parmigiano reggiano rind. Serve garnished with chopped parsley and grated parmigiano reggiano. Kevin, Your soup will be a great dish for our Festa Italiana, with your beans, sausage and kale combo, it will surely hit the spot! Thanks for joining in! Everything you made this week look so good. I love soup. It’s so comfort food. Looks delicious! Aren’t parmesan rinds amazing? Yum, and I do admit I’ve never cooked kale. I’ve had it on my “try list” for ages. I love any kind of soup with tomatoes in there! It’s always so comforting to me. You got my vote for healthy dish – now I’m really feeling guilty for the chicken wings I ate today. I should have had the soup – and it looks far superior to the wings. Kevin, You’ve been a cooking maniac this week! Where do you find the time? The soup looks great! I love dishes like this. I make a similar dish with Portuguese chourico sausage. I love kale, and soup. This recipe goes into my recipe box. I feel comforted just looking at your picture. I’ve also meant to try kale, but never quite gotten around to it yet. This soup looks like a fantastic way to get started though! Kevin, that looks yummy. I like kale, especially the way my mum makes it. In Germany it’s traditionally served in a kind of stew, with potatoes, chopped onions and some smoked sausages. That’s a hearty soup and those beans look like Gigantes! Ok, that does it. I want to be your neighbor. Looks fabulous! I love rustic and chunky soups. It is warm, filling and offers some serious comfort. Kale always seems so intimidating for me to cook. It’s so dark, heavy and leafy. You did such a lovely job in combining all the flavors and colors! man this looks good. i bet that bread was perfect for soaking up extra broth!!! I keep wanting to try kale, too. This looks like a beautiful way to use it! Wow, I have been wanting to try kale as well. I never think of it when I’m at the market. This looks like a lovely, warming dish. I can’t wait to try this soup, it’s just what my appetite is craving! Kale and white beans go together so well. Bravo! But then you were genius to add the turkey sausage to it. I like the way your mind works. Even though the calendar says it’s almost spring, the weather says it’s still a good time for soup. This looks wonderful! Hearty and satisfying on a cold evening. 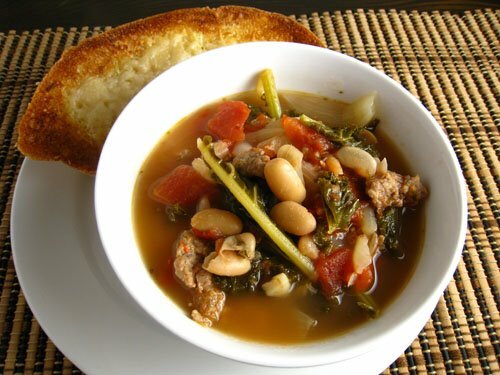 I’ve made a similar white bean soup with sausage and Swiss chard. Kale could be easily substituted in it–and Swiss chard would work in yours as well, I think. Sausage in soup is such a great idea! Looks absolutely delicious! I say it often but no one believes me!! Kale is one of the most under-utilized and delicious (and super, super CHEAP!) leafy greens around. I’m astounded at how many people don’t try using it… it’s extremely versatile and tasty and holds up well to long-cooking. Go kale, go kale. Actually I’ve had a ‘post in waiting’ that hasn’t been published yet on my love for kale… maybe it’s time? I love kale and white beans, this will be a great dish to try on a cool night! Really great Kevin! The few things I did different is substitute turkey sausage with spicy Italian sausage, put 2 cans of bean, fresh cherry tomatoes in place of canned and baby carrots cut in half. It is nice and hardy but still light. Sure treat and it all cooks in no time!! Just to let you know I am enjoying at I write this! Lovely! the ground turkey works fine and the flavoring from the black-eyed peas is nice. What really makes this version is the hot chili sauce, which gives the soup a spicy, slightly asian aspect. Turned out very well!!! what you can to be my friend? Kevin, it has been ages since you posted this recipe; nonetheless, you deserve a great big pat on the back. It's one of my cold weather favorites. (In fact, I just made a batch tonight.) You're a talented guy and I look forward to seeing what else you're whipping up these days. Thanks Kevin! I made this with italian style chicken sausage because my grocer didn't have turkey sausage and it was WONDERFUL! Loved the parm rind tip. All I can say is you are AMAZING – I love your website and plan to order your cookbooks please, please keep on doing what your doing hundreds, thousands enjoy your post each day. Thank you!